A theological journal with a focus on the Triune God. For the academic, the layperson, the Christian. Within this edition you’ll find a unique array of contributions. 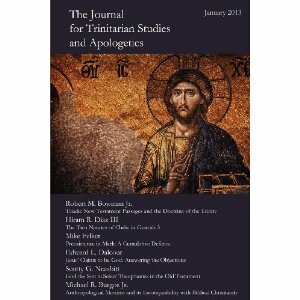 These include: Robert M. Bowman Jr. – Triadic New Testament Passages and the Doctrine of the Trinity Hiram R. Diaz III – The Two Natures of Christ in Genesis 3 Mike Felker – Preexistence in Mark: A Cumulative Defense Edward L. Dalcour – Jesus’ Claims to be God: Answering the Objections Scotty G. Neasbitt – God the Son in Select Theophanies of the Old Testament Michael R. Burgos Jr.(Editor) – Anthropological Monism and its Incompatibility with Biblical Christianity Published by Biblical Press: the publishing division of the Christian Apologetics and Research Ministry (CARM.org). The issue can be purchased from AMAZON for 6.50, but I will certainly make it available for free if an electronic version becomes available. I haven’t read any of the other entries, but my article is titled Preexistence in Mark: a cumulative defense.